More than 12 million Australians users have been connected to the Internet since the first 56kbps satellite circuit was created, according to the International Telecommunications Union. Internet access was available in 1989 initially to universities via the Australian Academic Research Network (AARNet) and was later offered by commercial Internet Service Providers during the early 1990s. The first connection saw Elz from the University of Melbourne and Neilsen from the University of Hawaii link AARNet to the Advanced Research Projects Agency Network (ARPANet) over a 2400 baud satellite link. Asia-Pacific Network Information Centre (APNIC) chief scientist Geoff Huston said the Internet pioneers predicted the shift in networking philosophy to a focus on fast, simple networks where applications deal with complexity. "Our conversation has gone beyond protocols and networks and now we talk about Twitter, about social networking, about Google, about hand held devices and similar, and we can have this conversation only because we were right about Internet Protocol," Huston said. "AARNet in just 6 years out-grew the Australian academic and research sector and forced a new agenda onto the mainstream communications industry, and in the next 14 years it continued to reshape this industry and now it has reshaped the way all of us work and play. "It was a unique opportunity that allowed a small number of individuals with attitude and enthusiasm the scope to put their ideas to test, and I am very grateful and honoured to have been able to play a role in all this." APNIC is the Asia Pacific regional information registry that maintains the Whois Database, manages reverse DNS zone delegations and allocates IPv4 and IPv6 address space and Autonomous System Numbers. 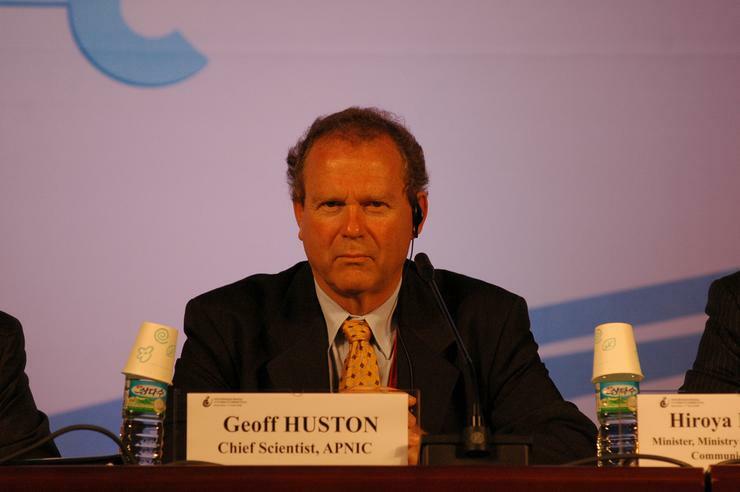 Huston led the construction of the Internet in Australia as part of the Vice-Chancellor's Committee, and has previously worked as Telstra chief internet scientist and AARNet technical manager. Not all telcos took the Internet seriously 20 years ago. Huston recalls that the then Australian Telecommunications Corporation was disinterested in the work conducted by the academics but was nonetheless happy to supply data circuits. "When we started out with this project, Telstra thought we were just mad... I must admit that we thought about it differently - we really believed that packet networking was the only way to allow silicon to talk and that if we could get the opportunity to prove it then we could build networks that really were faster, cheaper and far better than anything else around," he said. "The telephone companies were keen to promote ISDN (Integrated Services Digital Network), Frame Relay and ATM (Asynchronous Transfer Mode), and we were keen to point out the technical shortcomings with those approaches." Layer 10 analyst Paul Brooks said the next 20 years will see technology and Internet access as an inconspicuous part of life. “What we will see is improvements in the ease of use of technology until it evaporates into the background and becomes embedded into devices so people use them without knowing they are connected to the Internet,” Brooks said. Australia has kept on par with global technology research, Brooks said, but has lagged slightly in some milestones including the development and availability of Internet access. Connect.com.au was the first commercial ISP to use AARNet back in the early 1990's. Online access in Australia is now available through DSL, Hybrid Fibre Coaxial, and Satellite along with some of the world's best wireless access technologies. Australia will receive a mix of 100Mpbs Fibre-to-the-Home and 12Mpbs wireless Internet access under the federal government's looming $43 billion National Broadband Network, which will be bolstered by recent plans by Telstra and Pipe Networks to build new international undersea fibre links.